I picked up Dead Island as part of the Deep Silver Humble Bundle 2. 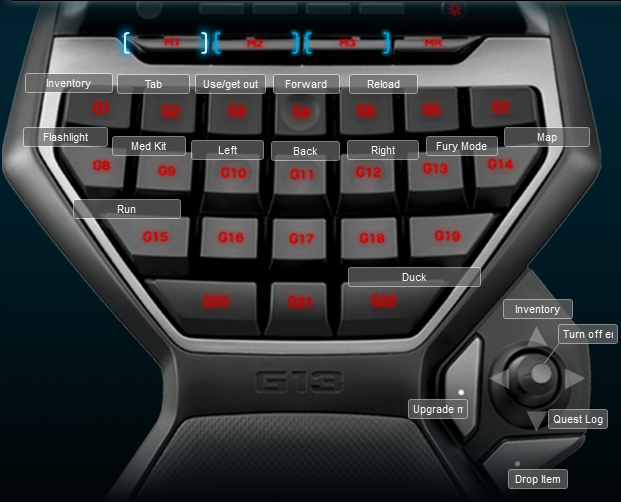 It had a default Logitech G13 profile, but I have gotten into a routine of just not searching and making my own. Usually this ends up saving me time because I have yet to find a default profile that is actually useful. Horror is not typically my genra for games, but this game seems some what interesting. I think it would probably be more enjoyable with a friend to take some of the anxiety out of the game. I don’t like playing game to make myself jump or freak out there are enough things in life that do that already. But when I buy a hundle then I want to make sure that I am getting my moneys worth. I setup the layout like a typical FPS configuration and swapped out the keys that were specific to the game. Below is a screenshot of the keyboard layout.